Hard to find setting offering almost total privacy on 2.76 acres of usable land with no HOA. Great Neighbors and Schools. 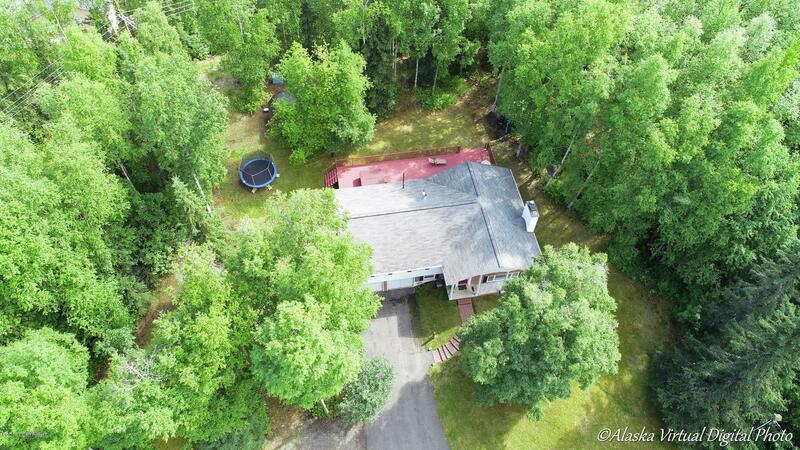 Perfect for entertaining, with a deck extending the full length of the back of the house., a large hot tub, and four extra parking spots off the driveway. Winter inlet views, with Sleeping Lady Mountain and the Alaska Range in the background, from the living room picture window. Mountain views of Chugach Mountain Range from the deck, hot tub, fire pit, and back windows. Beautifully updated inside, with cherry cabinets and granite countertops in the kitchen. Heated tile floors in the lower level master bathroom and laundry room. Brick fireplace for cozy winter fires. Master bedroom on separate level from other bedrooms. Laundry room doubles as a convenient mud room. Oversized heated garage w/double doors. Paved driveway, RV parking, storage shed. Frequent wildlife sightings. A large, flat, cleared parcel of land on the property was formerly used as an ice hockey rink and opens up possibilities for the buyer: could be another ice hockey rink, a raised garden bed, dog run, space to build a pole barn or workshop. Quick access to Glenn Hwy, with an easy commute to both Anchorage and the Mat Su Valley. Sellers are including a home warranty.